Who knew that Balmain did hair products as well as clothes? i certainly didn’t until Balmain sent me this Pre Styling Cream. I wanted to see if this product would live up to the reputation Balmain has and i think it does its a pretty good product. I think pre styling products are really important because the set the base for all the styling you’re going to be doing so what could be bad about that! Let’s face it none of us would leave the house without moisturising your skin, so now we can care for our hair in the same way. Pre Styling Cream is the ultimate pre-treatment application to give your hair volume and shine, When applying this you really don’t need that much product at all because i feel like its so concentrated a lot would be counter productive. Pre Styling Cream contains Argan Oil and Silk Protein to help condition the hair and protect it from styling damage. What do you use pre styling? 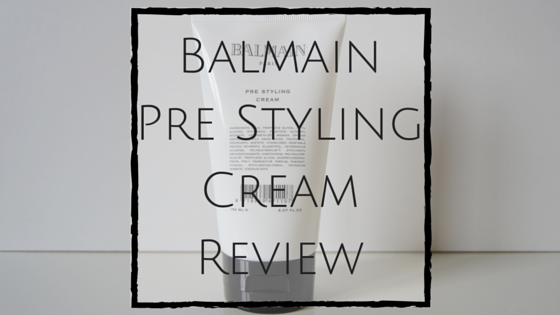 What do you think of the Pre Styling Cream ? First off, I want to say it’s so refreshing seeing a male blogger. Second, I love your blog! WAIT A MINUTE. Balmain sells hair products? How did I not know about this! This is freaking amazing! Like Sarah said, it’s so refreshing to see a male blogger and I wish there were more. It definitely brings more diversity in terms of opinions in the blogging community. I cannot wait to see more of your future content! Loving your blog.